Hutchinson outscored Salina South 21-7 in the second half to turn a 14-14 tie into a 42-21 win. Hutch racked up 363 yards of total offense and Brody Smith scored two touchdowns in the win. Lawrence improved to 5-1 on the season with a 42-10 stomping of Olathe South. Senior Trey Moore led the way with 180 rushing yards and three touchdowns. Dante Jackson rushed for 160 yards and two scores in the win. Lawrence Free State earned their second shutout of the season with a 35-0 win over Olathe Northwest. Zion Bowling rushed for 132 yards and a touchdown. Dallas Crittenden passed for 189 yards and two scores in the Firebird win. Washburn Rural used a couple of big plays to beat Topeka High 17-7 in Week 6 action. Sophomore quarterback Jordan White connected with Colin Wilson for a 64-yard touchdown pass on the first play from scrimmage to open the scoring. Ross Boyd connected on a 41-yard field goal attempt to give the Junior Blues the lead for good. Andover ruined Newton’s homecoming with a 45-21 win on Friday night. Things started well for Newton as following an Andover turnover, Kade Remsberg took the next play from scrimmage for a 65-yard touchdown and a 7-0 lead. Robert Bundy then tied the score with one of this two rushing touchdowns on the night. The teams traded touchdowns until Andover took a 21-14 lead on a touchdown run by Chase Oberg. The Trojans then scored the first ten points of the second half to lead 31-14. Bundy rushed for 120 yards and two touchdowns to lead the way in the win for Andover. KC Schlagle dominated KC Sumner Academy 70-8 to improve to 5-1 on the season. The Stallions were led by Cornelius Ruff who rushed for 238 yards and four touchdowns. The Schlagle ground attack accumulated 365 rushing yards and eight touchdowns in the lopsided win. Topeka Seaman improved to 5-1 on the season with a 35-20 home win over Emporia. The Vikings put the game out of reach in the first half after they built a 21-0 lead using three long touchdown passes of 71, 68 and 61 yard touchdown passes from Dalton Cowan. Cowan finished with 326 yards passing and four touchdowns. Nick Steiner and Kevin Moranz each caught two touchdown passes in the win. Valley Center outscored Goddard-Eisenhower 54-28 to remain undefeated on the season. The game was tied at 28 entering the fourth quarter before the Hornets scored 26 points to win. Wyatt Lange rushed for 183 yards and three touchdowns to lead the Hornets offensive attack. Lange also threw for 220 yards and three touchdowns, two of which went to Tyler Brown in the win. Abilene ran over Clay Center 35-14 to improve to 6-0 on the season. Parker O’Neal led the way with three rushing touchdowns while Ben Veach highlighted the game with a 57-yard catch and run for another Cowboy score. Atchison continued their undefeated season with a 55-27 win over KC Harmon. The Redmen racked up 289 yards rushing and three touchdowns in the win led by Dylon Leblue’s 100 yards on 13 carries. Quarterback Adam Smith threw for four touchdowns in the game including two to Austin Bonnel. De Soto shut out Baldwin 43-0 to earn their fifth win of the season. The Wildcats’ Bryce Mohl rushed for 126 yards and two touchdowns, while Darren Winans rushed for 108 yards that was highlight by a 71-yard rushing touchdown. McPherson won their fourth game in a row despite a 0-2 start to begin the season after a 44-8 win over Rose Hill. Casen Hoover threw for 182 yards and three touchdowns. Jeff Reed caught five passes for 108 yards and two of those catches were for touchdowns. Holton improved to 3-3 on the years with a dominant 66-26 win over Hiawatha. The Wildcats rushed for 452 yards and nine touchdowns in the win. Spencer Baum rushed five times for 155 yards and three touchdowns to lead the ground attack. A.J. Haussler rushed four times for 127 yards and two more scores in the Holton win. Hugoton won their second game in a row and improved to 4-2 on the season after 62-13 win over Southwestern Heights. Valentino Degollado threw for five touchdown passes and 242 yards to lead the Eagles air attack. Degollado also rushed for two of the Eagles three rushing touchdowns on the night. Zack Lenininger found himself on the receiving end of two of Degollado’s touchdown passes for Hugoton. Pratt shut out Halstead for three of the four quarters on way to a 34-6 win. Travis Theis led the offense with 211 of the teams 281 total rushing yards on the night. Theis also scored three of the four rushing touchdowns for the Greenbacks. Scott City rolled Wellington 41-0 on the Crusaders’ homecoming night. The Beavers scored on four of their first five first half possessions to take a commanding 27-0 lead into the locker room. Scott City’s defense held Wellington to just 17 total yards of offense in the first half as they dominated both side of the football. The Beavers improved to 4-2 on the season despite starting 0-2 to begin their 2016 campaign. Rock Creek earned its first win of the season with a 35-7 victory against St. Marys in Mid-East League play. St. Marys had been 3-2. Rock Creek led 14-7 after the first quarter and didn’t permit any points the remainder of the contest. Taybor Vetter rushed for scores of 38 and 47 yards. Skyler White and Vetter each exceeded 100 rushing yards. Southeast of Saline won the NCAA title with a 48-26 home victory against Beloit in a battle of undefeated squads. SE Saline delivered 452 total yards as all-state receiver Ben Murray rushed 18 times for 174 yards and two scores. The Trojans hadn’t scored more than 28 points in a game against Beloit since 2004. SE Saline remained undefeated at home in the last two seasons. 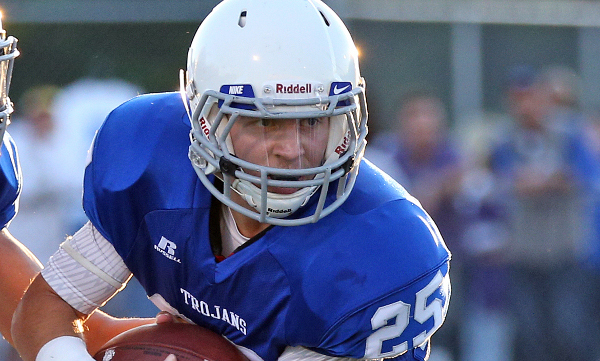 The Trojans had averaged 124 rushing and 230 passing, but rushed for 333 yards versus Beloit. Beloit finished with 267 yards of total offense, all but four on the ground. The Trojans finished plus-2 in turnover margin. Fourth-year coach Dustin Heuer continues to turn around the Marysville Bulldogs. He didn’t win a game in his first two years before posting a 4-6 record last year. Marysville is now 4-2 after a 25-0 victory against Chapman. The Bulldogs scored seven points in the first quarter, 12 in the third, and six in the fourth. Hunter Warnick scored on two runs of 73 and two yards and Derek Roever returned a kickoff 65 yards for a touchdown. Nemaha Central defeated Perry-Lecompton, 48-7, and didn’t allow any points until the final quarter. Jacob Koelzer had 179 rushing yards and scored on runs of 92 yards, one-yard, four yards, 83 yards, and one-yard. The Thunder remained undefeated ahead of this week’s showdown with Sabetha. Sabetha, a 7-5 team last year, moved to 6-0 with a 79-0 victory against Atchison County. Sabetha scored twice on non-offensive touchdowns on a 15-yard interception score and a 45-yard punt return. The Bluejays have three shutouts in the last four weeks and have permitted just 43 points this season. Syracuse bumped to 3-3 entering district play with a 64-13 victory against winless Sublette. Garrett Wilson collected three receiving scores of 35, 12 and 33 yards. Cody Doze also caught two scoring passes of 33 and 35 yards, and Ty Vernon scored on runs of 12 and 16 yards. Syracuse was 0-5 entering Week 6 last year but is now 7-4 in its last 11 contests. Mission Valley defeated Northern Heights, 54-13, and improved to 5-1 with its only defeat against Lyndon. The Vikings scored 27 points in the third quarter to pull away. Blake Roberts scored on runs of 19, two and two yards. Clay Phillips had a 54-yard scoring run and a 40-yard touchdown pass. Sam Gleason returned an interception 60 yards for a score and threw a 15-yard scoring pass. St. Mary’s Colgan improved to 3-3 with a 45-0 victory against Riverton. The Panthers intercepted three passes in the first half, and the Colgan offense scored each time. As well, the Panthers opened the second half with a special teams score on a blocked punt by Alex Brown, who fell on the ball in the end zone. Inman defeated Moundridge, 17-14, its annual rivalry game and delivered a huge win in District 5. The Teutons opened 0-4 but earned a 10-7 victory in Week 5. Sophomore Payton Froese is 2-1 as the starter since he took over injured Keaton Case. He went 6 of 13 for 109 yards and two touchdowns, including a 67-yard touchdown. In the third quarter, Taiten Winkel tallied a 21-yard goal after Moundridge fumbled at Inman’s 10-yard line. Moundridge held a 225-207 yardage advantage, and Inman had six turnovers. Republic County defeated Russell, 21-14, on the road in NCAA play. The Buffs led 14-0 after the first quarter after they scored on its first two drives. Republic County’s defense held Russell quarterback Alex Windholz – who has enjoyed a great season rushing – to 19 carries for 69 yards. He also passed for 74 yards and a pair of scores. The Buffs broke a 14-14 tie with a touchdown with 7:20 left on a three-yard run on fourth and goal from McKenzie Cromwell. The Buffs finished with 187 rushing and 108 passing yards. Russell turned the ball over downs in Republic County territory with 3:30 left. Meade rolled to a 58-12 win in a non-district visit to Whitewater-Remington. The Buffaloes scored 37 points in the first quarter to grab control. Lawson Luetters completed 5 of 6 passes for 136 yards and a pair of touchdowns . Blake Keith caught two passes for 74 yards and a score, while Aidan Miller caught an 8-yard touchdown pass. Luetters led Meade with 140 rush yards and a touchdown. Kale McCulloch contributed 109 yards and a score, while Keith added two touchdown runs. Herington bounced back from its loss against Clifton-Clyde and defeated one-win Valley Falls, 56-6. The Railers scored 36 points in the first quarter and 20 in the second. Trenden Schneider passed for scores of 35 and 37 yards and rushed for a 33-yard score. Tate Becker rushed for a six-yard score and passed for a 65-yard pass to Jonathan Lollar. As well, Edison Roether returned a kickoff 60 yards. Herington (5-1) is at 5-1 Rural Vista in what is likely an elimination game for one of the two district spots from District 3. Sedan remained unbeaten with a 74-24 victory against one-win Southern Coffey County. Senior Jake Mills had a massive performance with scoring runs of one, 25, three, 20, 45 and 36 yards and returned a punt for 64 yards and a score. He also threw a 17-yard scoring pass. Satanta (4-2) rolled over Kinsley with a 52-0 win in a contest that ended at halftime. Sophomore Gabriel Salas, who entered the game with 418 passing yards and 832 rushing yards with 22 scores accounted for, delivered another big game. He had touchdown passes of 14 and six yards and rushed for scores of 33 and 65 yards. Overall, he finished 4 of 5 for 90 yards and rushed six times for 124 yards. Victoria (3-3, 1-1) earned an Eight-Man, Division I, District 4 road win with a 62-42 road win against Bennington. Collin Kisner rushed for 218 yards and five scores, and junior Cooper Pfanenstiel tacked on 142 yards and two touchdowns. Bennington (2-4, 1-1) led 28-16 early. The Knights will likely have its playoff hopes on the line next week when it plays host to unbeaten Osborne, ranked No. 4 in the classification, at 6-0, 2-0. Victoria has reached the playoffs for 14 straight seasons. Hartford outscored Hutchinson Central Christian 94-60 to gain the first key win among three strong playoff contenders’ challenging for two spots in District II. Clayton Fowler scored nine total touchdowns for the Jaguars in the win, including seven rushing and two receiving. Quarterback Danen Kistner threw three touchdown passes and returned an onside kick for a touchdown. Hartford led 62-30 at halftime, and 76-44 after three quarters. Caldwell, Hartford, and Central Christian have separated themselves as favorites in the district to this point, and the Jaguars took a big step towards a playoff spot Friday night in Hutchinson. Ingalls had a wild 62-58 home win against Minneola in a contest that likely decided the two playoff berths out of Eight-Man, Division II, District 8. Ingalls moved to 5-1, 2-0, while Minneola dropped to 3-3, 1-1. The Wildcats led 44-30 entering halftime before Ingalls scored 16 points in each of the last two quarters. Ingalls trailed 58-46 entering the final 10 minutes when Joe Clark had a 10-yard scoring reception to close with four points with 9 minutes, 43 seconds remaining. Quarterback Zean Cox gave Ingalls the lead on a 36-yard scoring run with 7:04 left. Cox rushed for 174 yards for Ingalls, while Mikel Osborne had 141. Tristan Haynes paced Minneola with 295 rushing yards. Ingalls has scored 314 points this season, one of eight teams in the classification averaging at least 50 points a contest. Otis-Bison rolled over Tribune-Greeley County, 62-6, in a key District 6 matchup at home. This week, the Cougars head to Dighton for another high-profile district game. Otis-Bison (4-2, 1-1) lost to Sharon Springs-Wallace County two weeks ago, and Dighton (6-0, 2-0) defeated SSWC this past week. Most importantly, Otis-Bison had a big performance from senior running back Brad Lightfoot, who has been hampered by ankle injury the last several weeks. Lightfoot rushed for 103 yards and a pair of touchdowns, while Kade Urban passed for 105 yards and three scores. The Cougars had a pair of non-offensive touchdowns, including a pick-six from Maitland Wiltse and a punt return TD from Blake Bahr. Before Friday, Lightfoot had just 16 carries since Week 1. Lakeside-Downs continued its turnaround with a 44-34 victory against Sylvan-Lucas Unified. In District 5, Lakeside is now in first place at 2-4, 2-0, while Sylvan-Lucas fell to 4-2, 1-1. The Knights are the only undefeated team in the district with four 1-1 squads. Before the last two weeks, Lakeside hadn’t won since Week 3 of the 2014 season. Lakeside outscored Sylvan-Lucas, 14-6, in the fourth quarter to win. Senior Dawson Johnson completed 7 of 12 passes for 183 yards with four scores. Johnson also had 18 carries for 102 yards and a score. Senior Tearnen Wyman tallied a safety. Matt Fred rushed for 302 yards and five touchdowns as Veritas Christian raced past Sunrise Christian Academy, 72-26. Fred also returned an interception for a touchdown to close out the scoring. The Eagles led Sunrise 16-12 after one quarter, then blew the game open with a 24-point second quarter to lead 40-12 at halftime. Michael Rask added 150 rushing yards and a touchdown for Veritas. Alex Wyatt threw three touchdown passes for Sunrise Christian. St. Mary’s Academy remained atop the Kansas Christian Athletic Association (KCAA) standings with a 46-0 shutout of the Manhattan-Flint Hills Christian Eagles. The Crusaders improved to 4-0 on the season and are giving up only 8.5 points per game. Weskan won the battle of unbeaten 6-Man teams in the state with a 72-45 victory over Golden Plains. Weskan quarterback Greg Kuykendall rushed for 222 yards and four touchdowns in the game on 29 carries. Kuykendall also completed 11 of 20 passes for 184 yards and seven touchdowns. He accounted for 11 touchdowns for the Coyotes in the game. Bailey McQuillan added 166 yards rushing, and caught six passes for 126 yards and four scores. Golden Plains was led by A.J. Camacho who rushed for 188 yards, four touchdowns and caught a touchdown pass. Camacho also retured the opening kickoff for a touchdown and had a pick-6 on defense. Pawnee Heights improved to 4-2 on the season with a 58-6 win over Wheatland-Grinnell. The Tigers were led by sophomore back Kade Scott who rushed for more than 200 yards and five touchdowns. Scott now has more than 1,100 yards and 20 scores on the season.